Check out the latest Lilllypost Reviews on My Subscription Addiction! Lillypost is a children’s book club for ages 0-7, offering board books or picture books, or a mixed pack for families with multiple children. 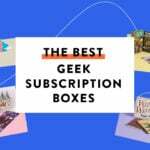 Read our reviews to see examples of the books we’ve received, how our kids enjoyed them, and don’t forget to use code MYSUBSCRIPTIONADDICTION to save 10% off any 3, 6, or 12-month subscription!